The genealogy community has been inundated with "information" about DNA testing. Several large DNA companies have had huge advertising and promotional activities and millions of people including those interested in family history have become interested enough in DNA testing to buy a kit and take the test. During the recent past, I have had a number of questions posed to me about the reliability of DNA testing in a genealogical context. These questions increasingly come from experienced genealogists whose DNA testing results seem contrary to their extensive paper research. This is particularly true when the DNA test results show small percentages of very surprising ethnicities. In addition, there have been news articles recently highlighting old high profile criminal cold cases that have been resolved using DNA evidence obtained from the genealogical DNA testing companies. See "Golden State Killer: DNA links ex-officer to California cold cases." Quoting from another news article about the California case entitled, "A look at DNA testing that ID'd the suspected Golden State Killer." It is clear that DNA testing, even when done specifically for genealogical purposes, will have an impact on many other aspects of our society including criminal investigations. There is a considerable amount of online discussion about the use of DNA testing that goes far beyond the genealogical community. For example, the FindLaw.com website has a section entitled, "How DNA Evidence Works." Here is a quote from a section of the article about the accuracy of DNA evidence. Assuming that investigators properly collect and handle biological evidence and that the forensic scientists employ accepted methods and conduct the analysis correctly, DNA evidence is extremely accurate. The chances of one individuals DNA profile matching another persons are extremely small -- about one in a billion by some estimates (but there is quite a bit of debate about this). Compared to fingerprinting or eyewitness testimony, which both have inherent flaws and inaccuracies, DNA evidence is a highly effective way to match a suspect to biological samples collected during a criminal investigation. Because of its accuracy, criminal lawyers increasingly rely on DNA evidence to prove a defendants guilt or innocence. DNA evidence has also exonerated people through postconviction analysis of biological samples. Since DNA analysis didn't exist until recently, a reexamination of evidence collected during older investigations can reveal that the DNA profile of the person convicted of the crime does not match the DNA profile from biological samples collected at crime scenes. The article points out that currently, laboratories use tests based on the polymerase chain reaction (PCR) method, which allows for testing on very small amounts of DNA from biological samples. Many of the online articles interject privacy issues into the DNA discussions. In the legal community, raising the issue of DNA testing and privacy is what is commonly called a "red herring" or an argument that is used to divert attention from the real problem or matter at hand. The legal issue is referred to as "a reasonable expectation of privacy." Here is a quote explaining this issue from the Cornell Law School, Legal Information Insitute entitled, "Expectation of Privacy." If both of these requirements have been met, and the government has taken an action which violates this "expectation," then the government's action has violated the individual's Fourth Amendment rights. Hmm. The DNA testing done by genealogy companies is certainly "with consent." You have to buy the DNA testing kit and voluntarily send the kit to the company. The key here with genealogical testing is consent. The entire issue of privacy becomes irrelevant when you give consent. By the way, the same arguments occurred back when fingerprinting and photographs were being required for employment and other activities. Before going too much further in this series, I need to lay down some basic ground rules that are well illustrated by the examples I used previously. There is an interesting tendency among genealogists to focus on "end-of-line" situations. Because the number of your potential ancestors doubles every generation (at least), you will inevitably have thousands of end-of-line ancestors. We all like to launch off into the unknown and explore new territory. However, this tendency often results in stepping off into the metaphorical fire swamp of genealogy. (Yes, Princess Bride) My second and third posts in this series are an excellent illustration of what I mean. Inevitably, every generational step backward in time increases the complexity of the research process. If you skip over generations because the work is all "done," you automatically assume this complexity without realizing whether or not you are basing your research on "firm ground." 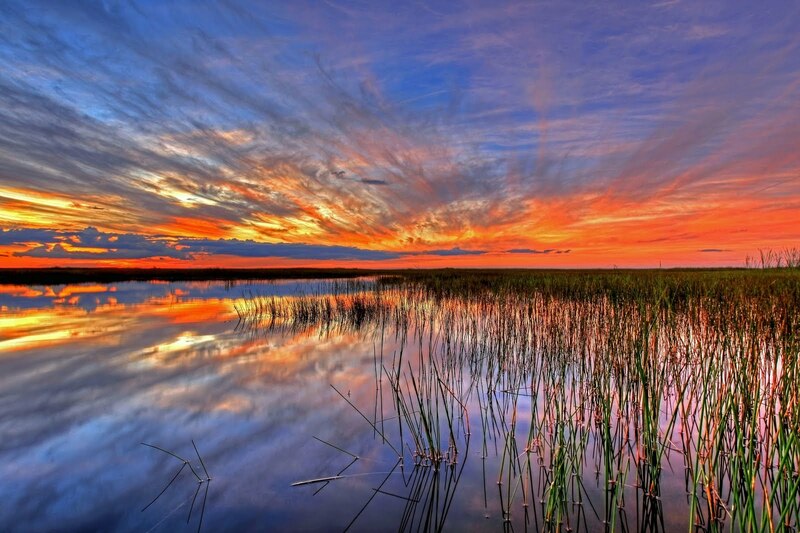 Hence, the "fire swamp." When I jumped in to help my friend with her end-of-line ancestor, Ignatius Gilpin, I dropped myself into the middle of her ancestor's potential fire swamp. This situation occurs constantly with unified family tree programs such as the FamilySearch.org Family Tree. It is remarkably easy to click back and find "virgin" territory. My efforts in the past two posts amply illustrate the problems involved in making that often tragic mistake. The tragedy is that the harder you hit, the more you stick. I call this a "Cholla Cactus" problem. If you have ever been close enough to a cholla cactus to get stuck, you know what I mean. See Wikipedia: Cylindropuntia. 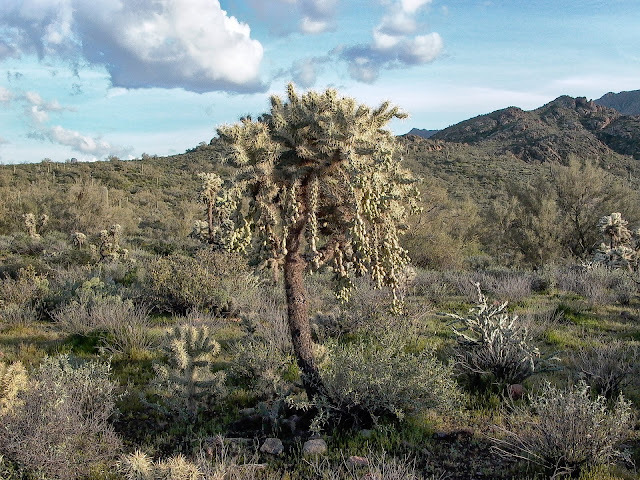 Classic examples of end-of-line cholla cactus are the passengers on the Mayflower. There is probably no small group of people in history who have had more scrutiny from genealogists and have more poorly documented entries in online family trees. This brings me to the next group of people who appear in online family trees that I call "revolving door" ancestors. These are the people who everybody seems to have an opinion about but no one seems to agree about the supporting documentation. Their birth dates, places and almost everything else seems to change regularly. In short, genealogy without sources is mythology. So how do I go about approaching an overwhelming problem such as the one outlined for Ignatius Gilpin? I started to look at some of the issues in the previous posts, but now it is time to get down to brass tacks and explain an exact methodology for making progress with these sticky end-of-line issues as well as with more mundane, easier to resolve ones also. Where do I start? Right at the beginning. What do you know about your parents? You have to have a well documented and very firmly established basis for extending your research out to the end-of-the-line. As I have written before; the water has to get to the end of the row. Now, it is time to go back to the Ignatius Gilpin problem and start with a firm foundation of sources and take the research one step at a time. Holly Hansen has supplied a lot more information about his family than we had initially in the FamilySearch.org Family Tree and now we can, at least, set up some realistic research goals rather that sitting out in a lake shooting at fish with a rifle. Water and air both seem to have bad effects on paper, but direct physical destruction is irreversible. 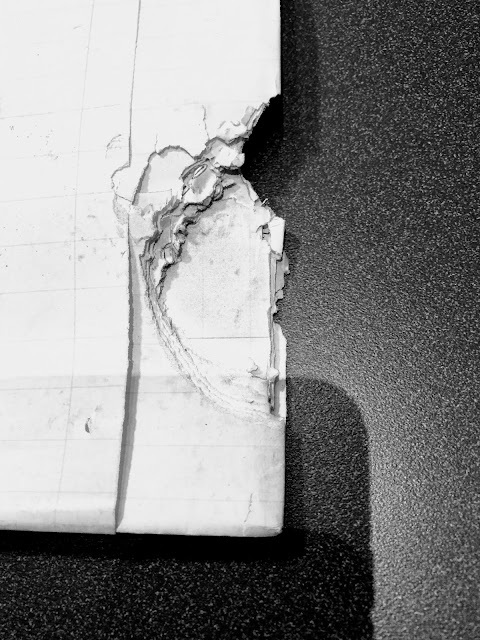 This week has been our week for documents destroyed by rodents, probably mice. Here are a couple of examples. The solution to this type of damage is rather simple: keep the varmints out of the storage area. However, in reality, this is a lot easier said than done. In many courthouses around the United States, old files are kept in insecure containers or simply piled on shelves. When I was young, we lived in the country and we had a constant rodent problem in our house. This type of damage is inevitable in that type of situation. Some damage to paper comes about simply from use. This photo demonstrates a combination of use and chemical deterioration. 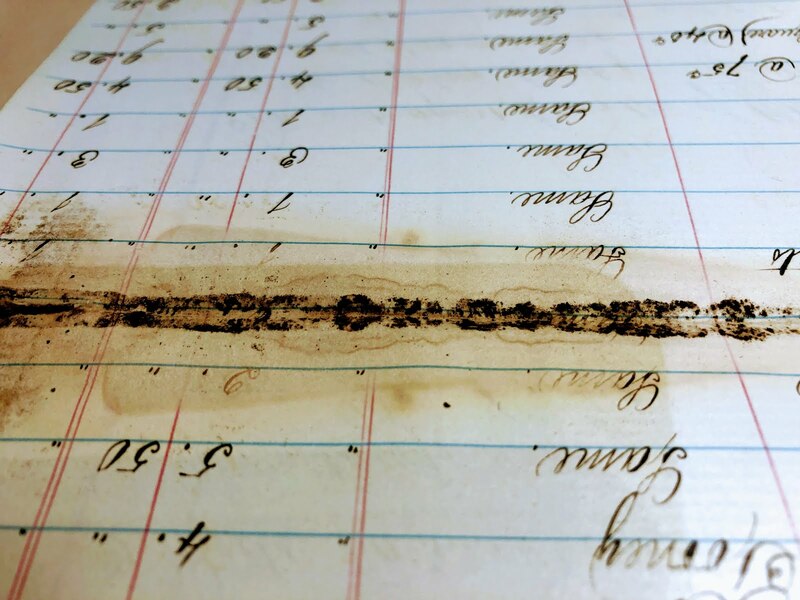 The edges of the document have been exposed to light and moist air, but the real damage came from use. Obviously, documents are meant to be used. From my perspective, this is one of the most persuasive benefits of digital documents: they don't wear out with use. As a side note, when I try to take photos of the documents, the light is from different sources so I get strange shadows. 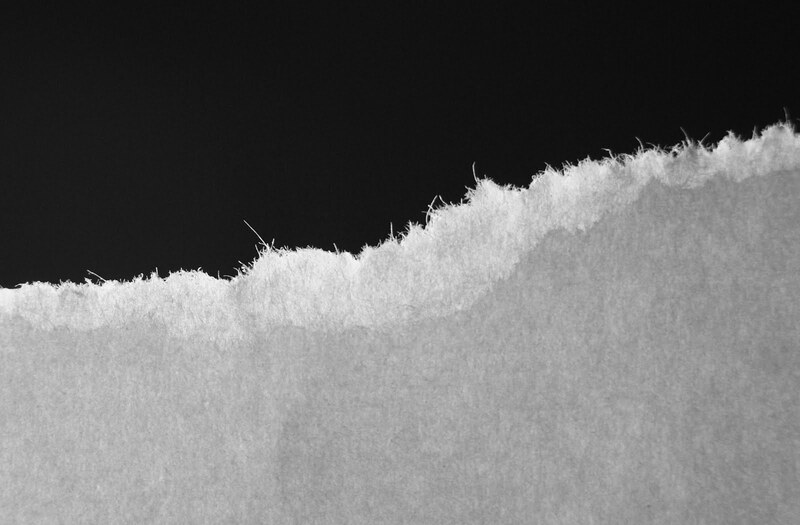 Paper is amazingly durable, but it tears easily and when folded, the folds break the fibers in the paper and make it subject to further damage. Here's a closeup shot of what happens when the paper begins to disintegrate from folding and chemical weathering. There is also some evidence of mold damage around the folds in the paper. We also see an appreciable amount of damage to paper because of metal fasteners, rubber bands, self-adhesive tape, and glue. 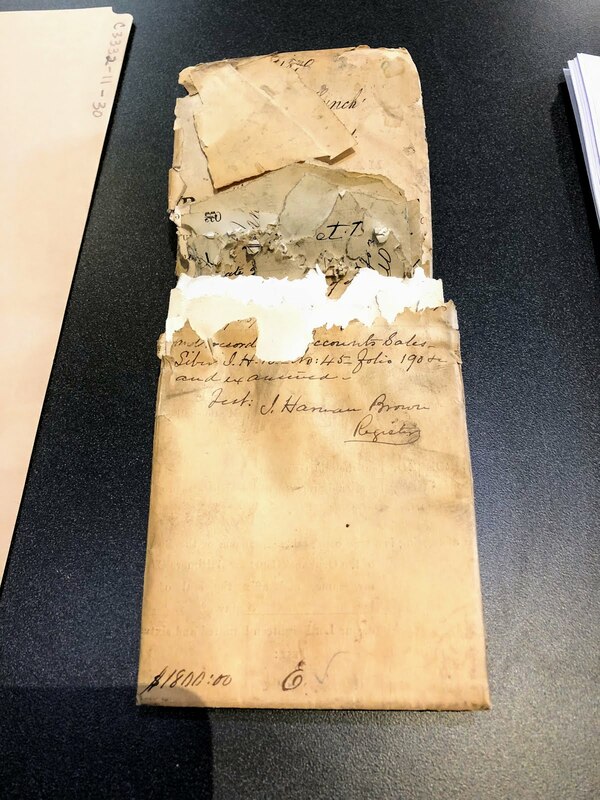 Here are some short rules for the proper care of paper when handling from the Library of Congress article, "Proper Care and Handling of Works on Paper." Individual/isolated storage of acidic papers to prevent acids from migrating into the other works on paper. 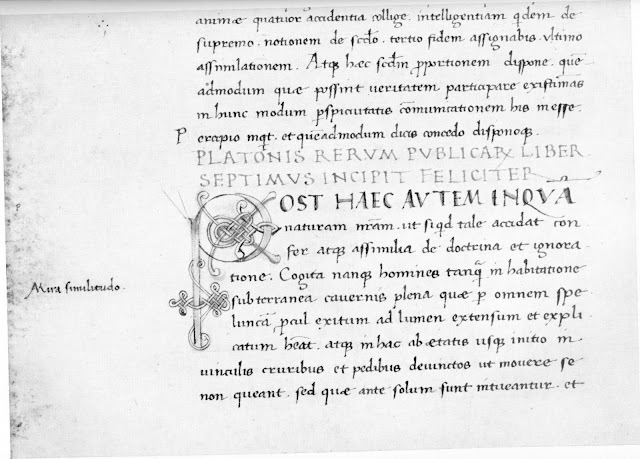 This document shows Ignatius' signature. The J Gilpin is really "I" or Ignatius Gilpin. In addition, from the previous documents, we have one of the children named in the FamilySearch.org Family Tree: Green Gilpin. With these four names, we are starting to get a cluster of family members. But where are these people? There are also several Georgia marriage records showing a marriage to Nancy Denham. These marriage records are attached as sources to the FamilySearch.org individual record. Because of our collaboration, we increase our efforts. Obviously, we need to separate true collaboration from the random addition of unsupported information. We have the names of all the people mentioned in the probate records. The handwriting in the record is poor so many of the names are approximate based on reading the record. Here is a partial list of some of those names. We have dates from 1800 to around 1821 or so. We also have names of some family members. What do we do with all these names? During the time period when Ignatius was living in Georgia, there were three and possibly four U.S Censuses. Let's see if any of these names appear in the Census for either Columbia, Putnam or Laurens County. Well, guess what? There are no U.S. Censuses for Georgia in 1790, 1800 and 1810. What is available is the Putnam County Tax Digests for 1817, 1820, 1824, and 1852. Georgia is organized into Military Districts and you can sort out where the people lived by finding out where the individual military districts were located. Of course, that is assuming the districts had some geographic reference. So, we are back to looking up some history. Hmm. 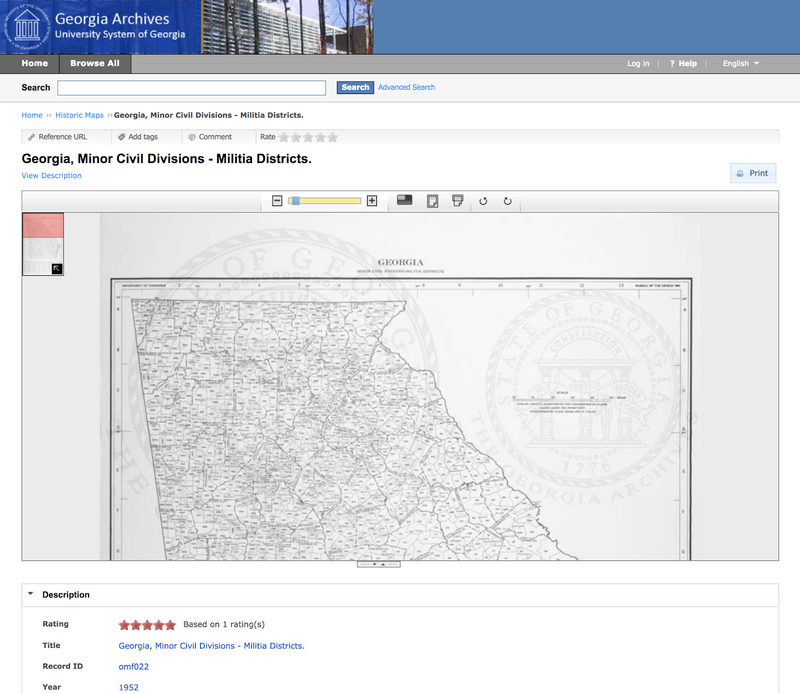 The Georgia State Archives has a map of the "Georgia, Minor Civil Divisions - Militia Districts." So it looks like the process is to search the tax records and then put the people on the Militia District maps. 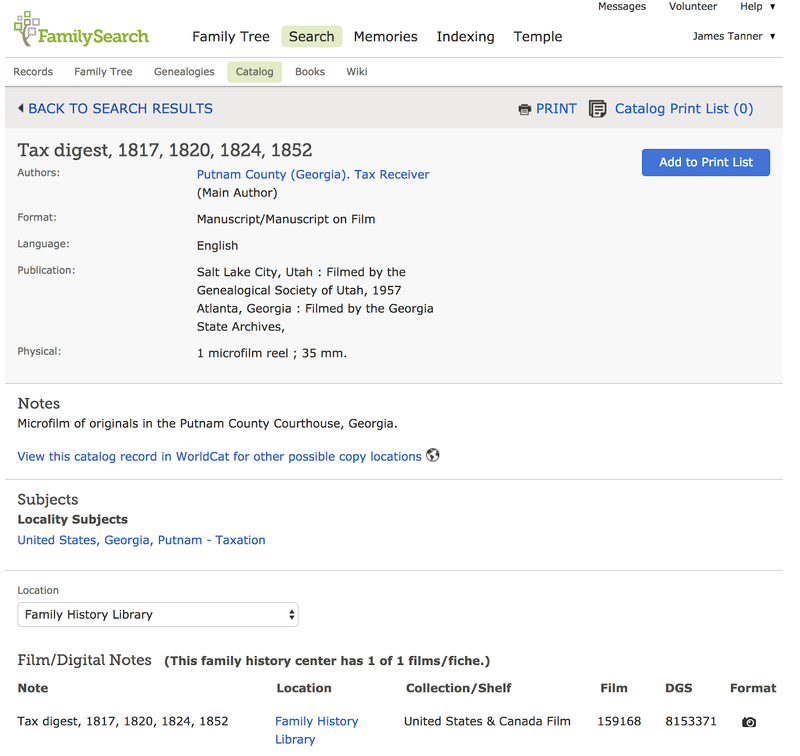 The Putnam County Tax Digests for 1817, 1820, 1824, and 1852 records are about 335 images, so that will take some time. 1. Ignatius Gilpin married Charlotte Vinson as proven by Legislative act making their marriage contract null and void as reported in the Georgia Gazette 9 February 1798. Who is David Gilpin listed as their child born 9 months after this decree was made? 2. Ignatius Gilpin married Nancy Denham the daughter of Charles Denham. She has a brother also named Charles Denham. 3. Nancy Denham's father Charles died June of 1805. Therefore he is not the same Charles who was appointed Administrator of the estate of Ignatius Gilpin. The most likely candidate for the Administrator is Nancy's brother Charles. 4. David Vinson is Charlotte Vinson's father. The David Vinson on FamilySearch.org Family Tree has many errors and problems. The probate detail listed in the source information is for a David Vinson who died in North Carolina in 1810. It also lists Frances Vinson as his widow and relict. The Tree has his wife listed as Hannah Watkins. The Tree has 13 children listed for David and Hannah. 5. In the Columbia County, Georgia probate records the will of David Vinson of Richmond County, Georgia is filed in Columbia County. There are two instances of the will. The original and a clerk's copy in the books. The will names one daughter, some grandchildren, and great grandchildren. It details the situation with his grand daughter Elizabeth Gilpin Denham Melton and her children. The copy gives the daughter's name as Charlotte Johnson, where the original actually says Charlotte Jackson. The copy gives one granddaughter with the name of Rebina where the original clearly has her listed as Rebecca. So, the clerk made copy errors as well. I have not connected this will to David Vinson on FamilySearch.org Family Tree as there are too many errors. It leads one to ask: Who is the real David Vinson? If he had several children why was only one listed in the will? Who is Hannah Watkins? Is she the real mother of Charlotte Vinson? Or is there another David Vinson researchers have missed? (records inn the tree have him in Massachusetts, Virginia, North Carolina and Georgia). The will of David Vinson is needed to understand some relationships of Ignatius Gilpin's family members. 6. Very little is known about Ignatius Gilpin's second wife, Nancy Denham, the daughter of Charles Denham and sister of Charles S. Denham. FamilySearch.org Family Tree has Charles Denham mixed up and merged up with other men of the same name. Also, Charles son's James Denham and Charles S. Denham have been mixed up with men of the same or similar names. These families need to be pulled apart and listed correctly on Family Tree. We know that Charles Denham of Columbia County, Georgia was married to Sinai. Charles Denham of Liberty County, Georgia was married to Ann. In Family Tree Sinai and Ann have been merged into one person. They are definitely two distinctly different people. So, the more we work on these families of early Georgia the more we see that name matching and forcing families to fit together has been taking place. I have more documents not attached to the tree, while I work out the details on how to correct the errors. 8. John Lucky, Collins H. Belcher and others appearing in the estate papers of Ignatius Gilpin are tied to the Vinson and Denham families. The part that makes it challenging is the extra people stuffed into families and the multiple individuals of similar or same names being merged into one person. How to separate these and rebuild accurate families is our goal and desire. As you can see, we have stepped off into a Fire Swamp of details. Stay tuned to see my thoughts on working through such complex problems. This is one of those things that I heard about a while ago but could not really write about until the official announcement. How does this compare to the other large online record websites? Nobody really knows. The main reason, as I have written about quite a few times in the past, is that every one of the websites count their records differently. The meaning of the word "record," "individuals," "collections" and so forth change so the actual size of the numbers depends on the definition. This said, having 2 billion of anything is a huge number. In this case, an individual record on the FamilySearch.org website is probably a single digital image which can have dozens or even hundreds of names. This news release explains another observation that I wrote about some time ago. Here is a quote. Remember, if you want to see all of the records, you need to find them in the Catalog. Here is the complete text of the News Release. 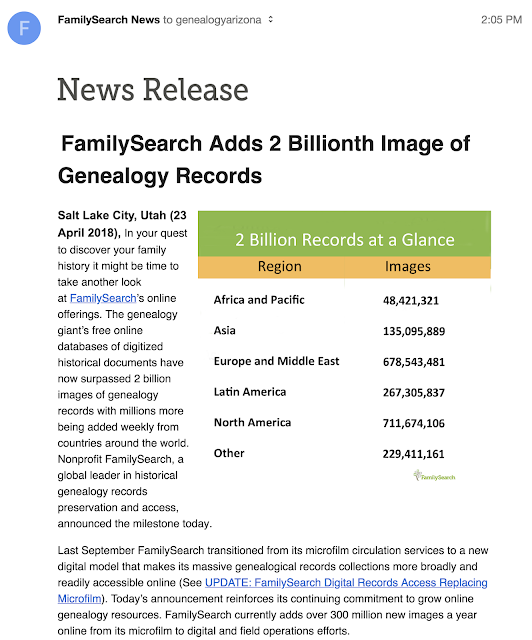 Salt Lake City, Utah (23 April 2018), In your quest to discover your family history it might be time to take another look at FamilySearch’s online offerings. The genealogy giant’s free online databases of digitized historical documents have now surpassed 2 billion images of genealogy records with millions more being added weekly from countries around the world. 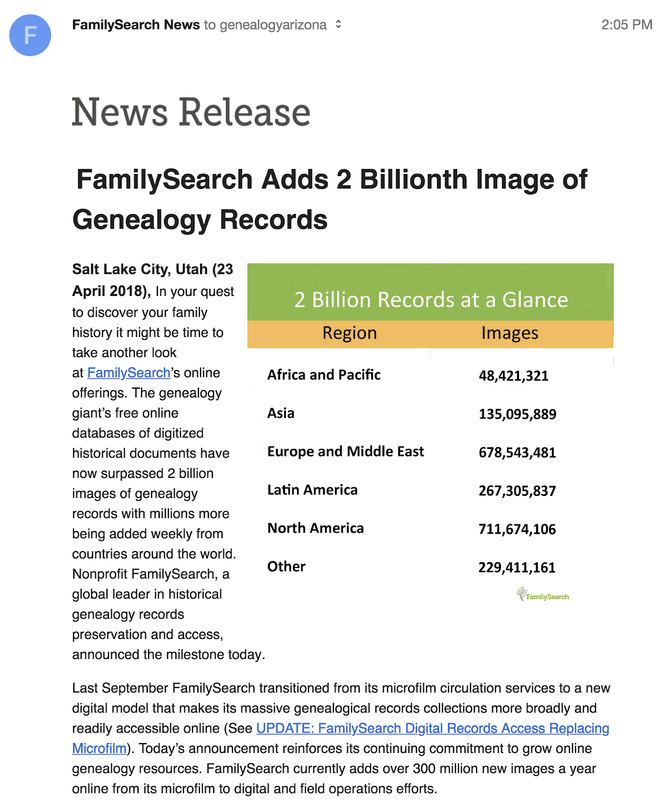 Nonprofit FamilySearch, a global leader in historical genealogy records preservation and access, announced the milestone today. I think the best way to begin this detailed discussion of the interaction between online resources and finding ancestors and relatives is to start with an actual example. 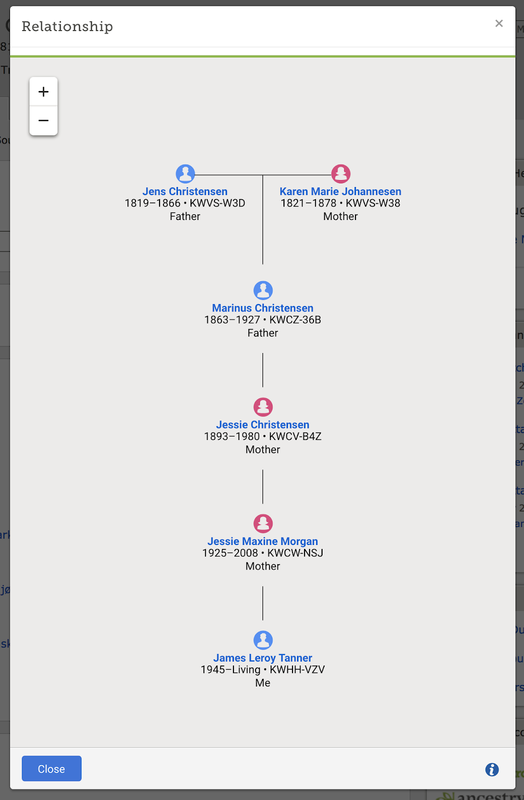 In my other family history blog, Rejoice, and be exceeding glad..., I have been writing a series entitled, "Building a Family Tree: An Example on FamilySearch.org" that illustrates using online sources, primarily the FamilySearch.org Family Tree, to find ancestral information about selected people in the Family Tree. I decided to use one of the people featured in that series. I have already done some research on this person and his family. I know that the main researcher, Holly Hansen, has done extensive research in Georgia. So far, in the Family Tree, there are four sources listed excluding a Legacy NFS source. The Legacy NFS source comes from new.FamilySearch.org, a discontinued program. The sources listed support a conclusion that Ignatius Gilpin lived in Georgia. 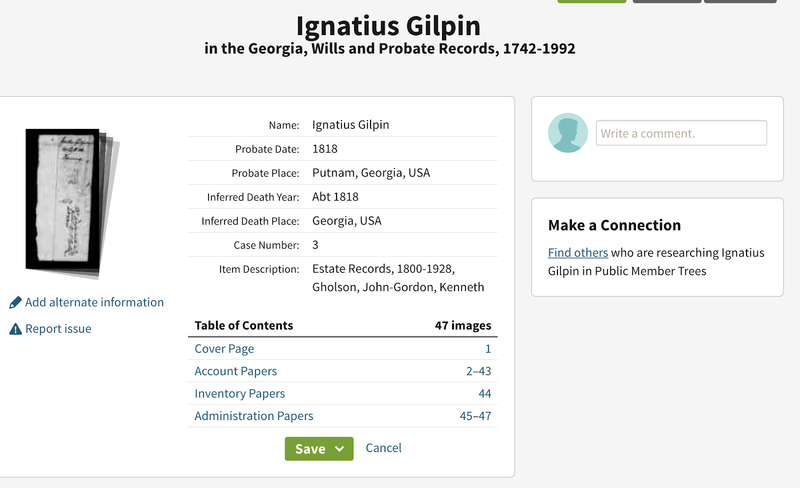 When I first looked at this person, the link to the probate record was broken and does not link to Ignatius Gilpin. The marriage records support a second marriage to Nancy Denham, but the other information about a first marriage and a list of children is unsupported by any sources in the Family Tree. This is not a criticism of the state of research on Ignatius but only the fact that anyone starting with this individual on the Family Tree will have to, in essence, start over doing research. In this case, as is the case in every family tree, there are always individual at the end of every family line. From my contact with Holly Hansen about this person, I know that there is a considerable amount of information about this family but not a lot about Ignatius. This is one reason why I have chosen him for this project. Here is an important suggestion about beginning your online research. The internet is a vast communication network. The core idea of doing genealogical research online is to gather information from a variety of sources and build up a web structure of information about families that supports reasonable conclusions concerning the details of their lives. When genealogists accumulate information on paper or keep it to themselves, even when they are "working" on their "preliminary" research, then anyone who is also working on that person or family has to repeat all the research. This collaborative model of online research is the antithesis of traditional genealogical research. This is a something that both Holly and I have taught and talked about many times. The status of this particular family right now, according to the data in the Family Tree, is that there is no supporting data to tie the children listed to these parents. Consequently, any researcher has to assume that the information is questionable. 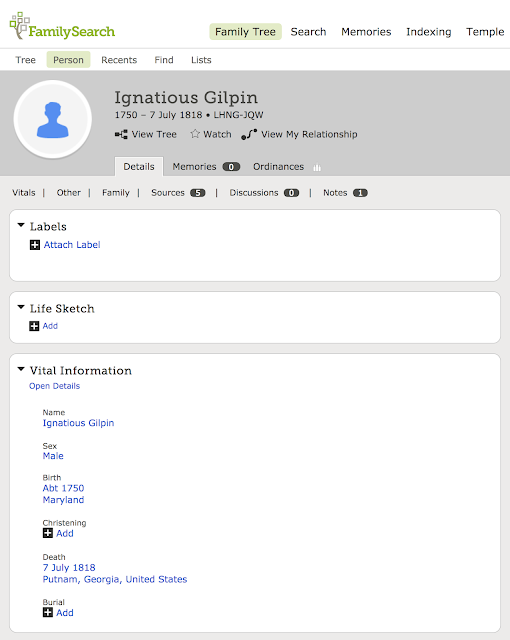 When I switch to a descendency view of Ignatius Gilpin, I see a huge number of descendants tied to this particular individual. There are extensive descendants listed for 4 of the 5 children. Here is the family as it is shown in the Family Tree. Perhaps the missing probate record is the key to tying this family together. I immediately found the probate file for Ignatius listed on Ancestry.com. I also updated the link so I could get back to this source in the future. The probate documents are all on Ancestry.com and consist of 47 pages of documents. Interestingly, the probate in Laurens County, Georgia is being handled by Charles Denham as administrator. Because he is the administrator of the estate, this means that there is no will. If there was a will, he would be the executor or whoever was named would be the executor. This name is not listed as a child of Ignatius, so who is he? By asking this question, I am beginning the process of building a web or cluster of people who can become the basis for identifying the main person who I will call the target person. I would suggest that it would be a good idea since family trees on Ancestry.com are not generally collaborative, to download copies of the documents and add the entire probate file as a Memory on the Family Tree. Then anyone, whether or not they have a subscription to Ancestry will be able to see the probate file. 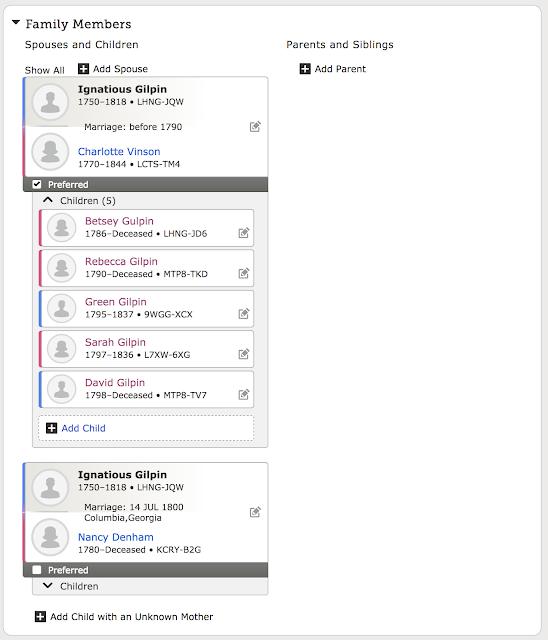 In the Family Tree, there is a Charles Denham who is listed as a brother of Nancy Denham, the second wife of Ignatious (various spellings) Gilpin (also various spellings). This is likely the administrator of the estate. But why aren't any of the children acting as administrator? This illustrates the process of beginning to ask questions about the research. Some of these questions may ultimately be answered, others may not be. There is a receipt from a "J. Gilpin" probably "John Gilpin." Who is this? There are no Gilpin children listed with the name of John or starting with a "J." There are other names in the probate file, mainly regarding debts owed to or from the estate. Who are these people and do we have them located in Laurens County at the time of the probate case? There is also a receipt from Putnam County. So here is another county for consideration. A quick look at the Newberry Atlas of Historical County Boundaries Project shows that in 1818, these two counties were separated by two other counties; Wilkinson and Baldwin. This is where I begin the process of identifying the locations involved in the research. Many of the problems associated with "end-of-line" problems are caused by looking in the wrong place. Where were these people? The receipts in the probate file show two different counties. By the way, the probate records show the Book and Folio of the place where the probate was recorded. If that record is available, it might answer the question of where the probate was administered. As I work through the probate file, I find a receipt from Green Gilpin to Charles Dunham in 1825. Here is the first document supporting the name of a child in the family. Next is a promissory note from a "J Gilpin" to Green Gilpin dated 1815. The dates on the receipts and notes start in 1811 and continue through 1821. One document looks like it is dated 1825. Another observation, the appraisement of the property of the estate shows that Ignatius was very poor, the total value of the estate being about $100. The date on the appraisement is 1818, so this is likely around the time the estate was filed. The earlier dated documents were probably part of the estate. This supports a death date in 1818. This date is also supported by the Administrators' bond dated 7 September 1818.
Who is J or John Gilpin? Why was Charles Denham the administrator and not one of the children? Why is there no mention of a wife? Who are all the other people mentioned in the probate file? Why were there two counties listed? Why were no other children listed with receipts? Here are also a few speculative conclusions. Where do I go from here? That depends. After asking these questions, I need to find out if there is already someone out there with some more documents, not immediately available to me. My next step is to see what shows up in the 1790, 1800 and 1810 U.S. Census records. Stay tuned. Here are the conclusions to this point. 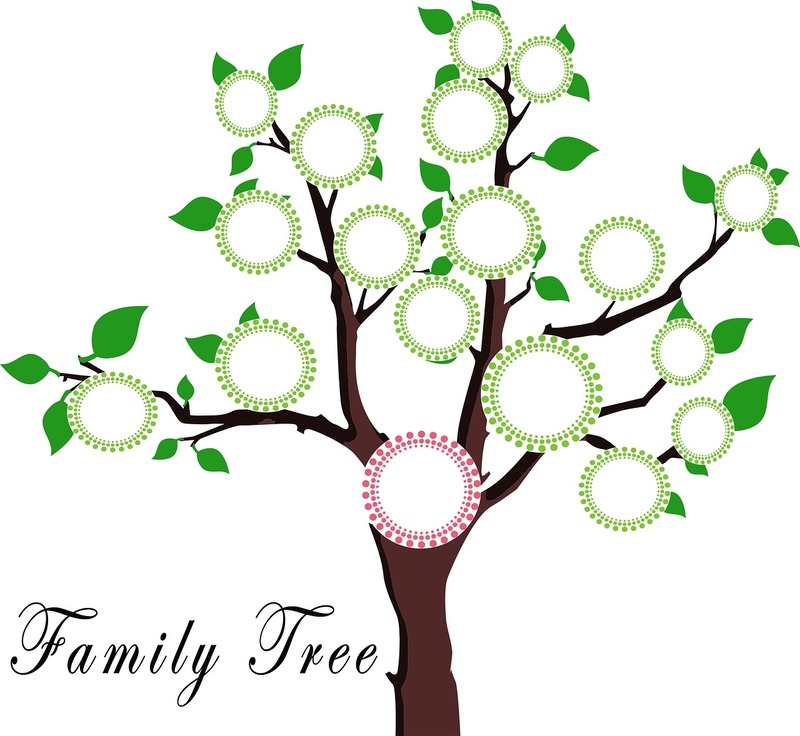 It is extremely important in today's world to have your research online in a collaborative family tree, preferably the FamilySearch.org Family Tree and to have copies of all the records you find either attached as copies or linked online to any entries. It is also very important to extract all the possible information you can from the records you do find and then ask all the questions about the record. You might also have noticed that it is important to understand the records. In this case, we have a probate record so understanding the process and documents is crucial to making any progress in finding more information. It is also important to look at the places mentioned to see if they make sense. In this case, we now have two counties to look at. Water is one of the most insidious enemies of paper documents. 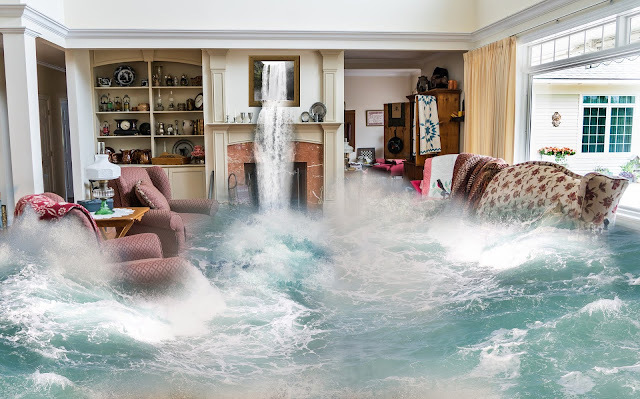 Damage from water is not limited to catastrophic floods, even high humidity can be ruinous. When I was living in Argentina, all of my leather goods started to grow mold. This problem was even worse when we lived in the Republic of Panama in the jungle. But you don't have to live in a jungle to have a mold problem. Here is an example of a document I found at the Maryland State Archives. 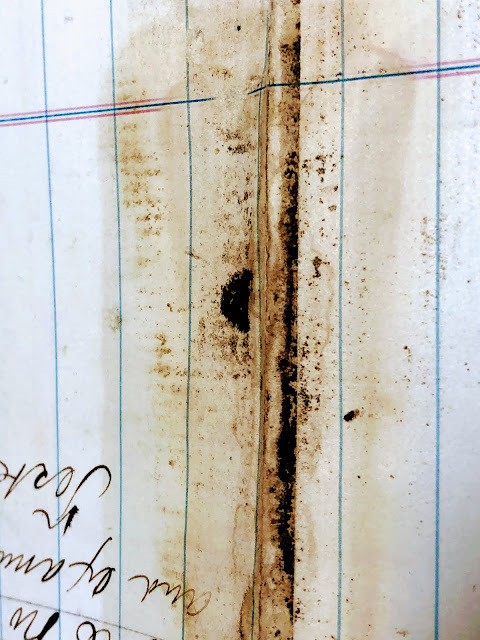 Even if you are diligent in storing and protecting your documents, they are not always immune to mold damage. Because this infestation is along a fold in the document, it probably originated before the document was archived. The black, sort of fuzzy, material is an active infestation. Here is another example. I have been given photo albums that were so covered in mold that they could not be opened or viewed without difficulty. Here is a definition of mold from a Biblio.com article entitled, "Identify, Prevent, and Remove Mold and Mildew from Books." Mold: Mold is a type of fungus that can and will grow on anything, as long as it can find a food source and the appropriate humidity for its development. It can develop in patches of threads, thick spider-webs or fuzzy spots, and it appears most often on natural, porous surfaces such as cotton, linen, silk, wool, leather, and paper. It reproduces by sending out clouds of spores, hence it's ability to “leap” from book to book. Not all spots or stains are mold, but almost all of them are. The word "mold" (or "mould" in some countries) is a generic term for microbes found in the taxonomic divisions of Zygomycota and Ascomycota. In the past, most molds were classified within the Deuteromycota. See Wikipedia: Mold. Mold is ubiquitous. I have even had a severe fungal disease known as "Valley Fever" or Coccidioidomycosis. Since both direct contact with water and high humidity combined with warm temperatures create fertile growing conditions for mold, there are some rather simple things you can do to prevent infestations. Here is a list of suggestions from the Biblio.com website article. Humidity is the number one condition for the growth of mold and mildew. It is the moisture in still, quiet air that allows mold spores to grow and spread. Think of dank basements, musty attics, or clothes left in the washer too long – these are prime mildew-growing habitats. Keep your books on a shelf that gets a decent air flow, not in a closet, basement, or against an outside wall of the house. Maintain good air circulation by using fans. If possible, use an air conditioner during the hot summer months and a heater during the cold winter to maintain a temperature around 70 degrees Fahrenheit (21 degrees Celsius). A dehumidifier should help to keep the humidity under 60 percent, but only when necessary. Books that are too dry can be damaged and crack. While houseplants are a lovely addition to a room, your library might be better off without them; or at least keep them away from the bookshelves. Dust the tops of your books regularly, as a clean surface is less attractive to spores. Some book collectors swear by the light use of lavender essential oil directly on the bookshelf as it is an anti-fungal, but this will scent the books and may cause discoloration. It is also suggested to keep a small, electric light burning in your bookcase, but this can also cause discoloration to your books over time. I do not agree with any solution that involves light. I will address the damage caused by light in a future post. I also do not agree with using any type of oil or any other substance to "prevent" mold. They may work or not, but they will cause additional damage to the paper documents or books. When handling documents or books that are infested with mold, it may be wise to use a filtered face mask and gloves. But in the cases of small infestations, washing your hands may be sufficient. You can really get into mold. Several years ago, there was a large lawsuit in Texas over a mold infestation that resulted in a very high jury verdict in favor of the Plaintiff. This case set off a national flood of mold cases. Within a year or so, as a trial attorney, I was handing dozens of potential mold claims. However, the insurance companies began eliminating mold coverage from their policies and the cases simply stopped being filed. There is still a residual amount of litigation, but from our perspective as genealogists, we are more concerned with preservation and remediation than litigation. I am listing several articles on mold remediation that will help to understand this issue. However, be careful to filter out the scare tactics used by some remediation companies that will want to charge you to decontaminate your home and duct system. 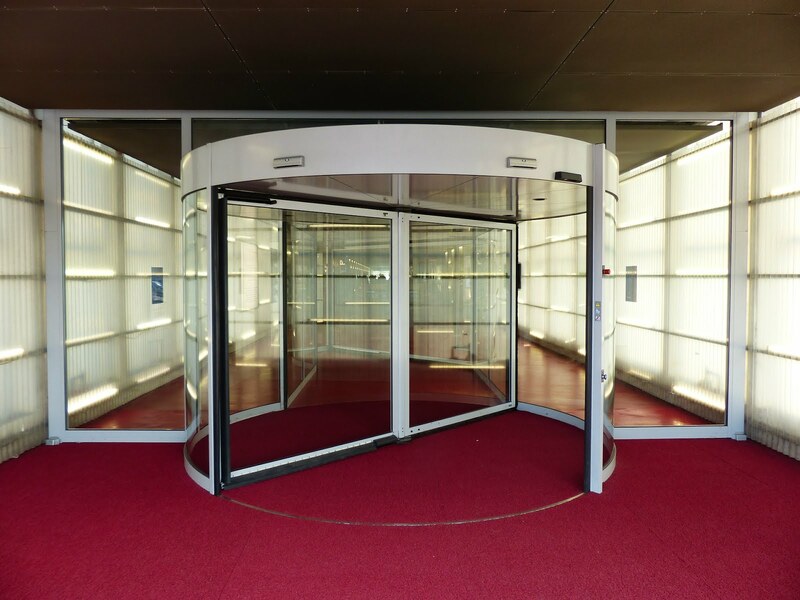 In some cases, where there are people with respiratory conditions, such as asthma, air purification and other extreme measures may be warranted. Here is a statement from the Harvard Library about the human health risks. Some molds that grow on library collections pose a health hazard to people. Mold spores are introduced to the human body by inhalation and through small breaks in the skin. Although serious consequences are rare, active mold can cause respiratory problems, skin and eye irritation, and infections. Such reactions may result from short-term exposure to high concentrations of mold or long-term exposure to low concentrations. Mold poses the same potential health hazard whether active or dormant. The degree of risk from exposure to mold is determined by a person's general health and pre-existing sensitivity to mold, as well as the concentration of the mold bloom. Staff members with compromised immune systems or known sensitivity to mold (e.g., allergy to penicillin) should not have contact with active mold. Here is an informational video about damage to paper suggested by one of my sons. 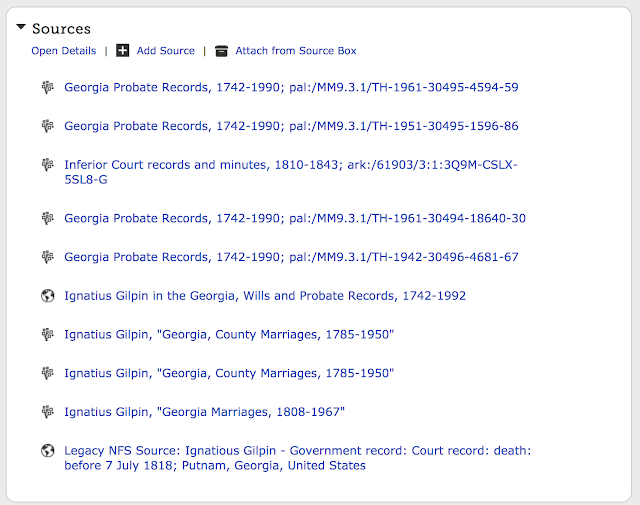 It seems obvious that since genealogists are primarily researchers, they would use online resources for their research. Unfortunately, that is not always the case. Many genealogists find themselves on the disadvantaged side of the digital divide. From the genealogical perspective, this division is caused by demographics: people who, for a variety of reasons but primarily age, motivation, and access, have not taken advantage of modern technology. This lack of technological ability can be as simple as discomfort with all things electronic to a rejection of everything having to do with technology from smartphones to the internet. 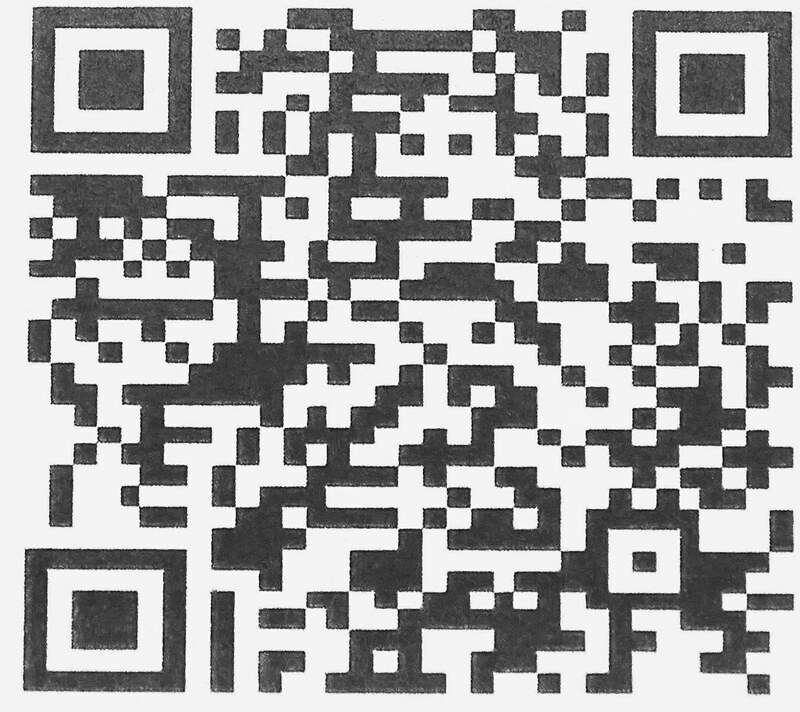 I have friends who are interested in genealogy, who can't type, do not have a smartphone, will not look at a computer and do not have an internet connection. I am not writing this series for these people. If you have adequate computer skills and a desire to do genealogical research, I am writing to you. 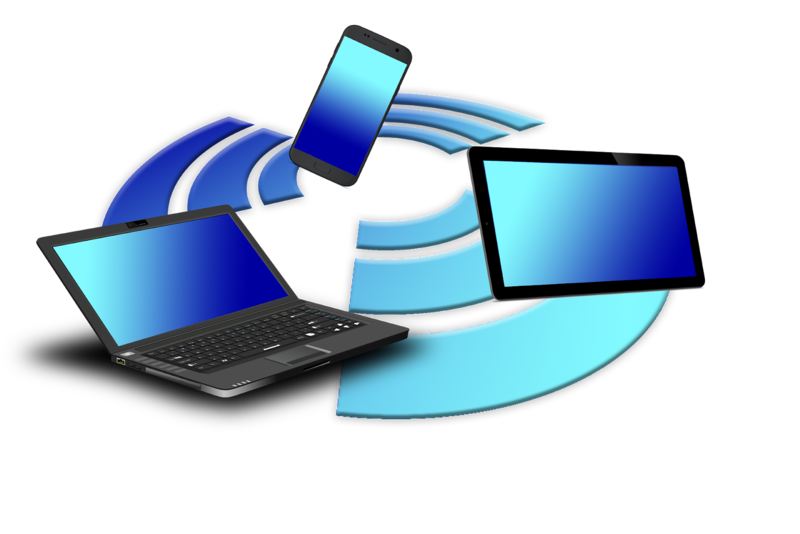 You may even have attended classes on using technology for genealogical research. But classes on the subject of online research usually focus on websites and resources rather than methodology. This series is not exclusively about Google or any other specific website. It is about learning how to use online resources in a way that materially assists you in finding your ancestors and other relatives. Of course, Google Search and all the other Google programs are an important and vital part of the online research process. But research online involves more than familiarity with a few websites, it involves a major adjustment in the way genealogical research is conducted. Some classes that focus on using Google Search and other online programs for genealogical research go into great detail about complex and often arcane ways to optimize searching using formulas and boolean algebraic functions and other specialized programs but neglect the important factors that make searching online productive. The Internet is more than just using Google and genealogy programs and genealogists need to adapt to the methodology that produces successful online research. This is not a new topic for me. I have written a number of blog posts and have several widely watched videos about using Google and other online resources for genealogy. However, technology changes constantly. The tools and programs I have today and vastly different than those I had ten or so years ago when I started writing this blog online. This series is my attempt to articulate what I have learned over the years and update it with information I have accumulated since my previous posts. Despite the dangers of repetition, it occurs to me that the topic needs to be given more intensive coverage with very specific examples.This continuing series is going to focus on augmenting the current genealogical methodology in a way that reasonably and exhaustively includes the sophisticated use of online resources, including a large dose of Google, to achieve genealogical research success. We are well into the information age and it is tragic how little of the vast online resources available are used by most genealogists. I might suggest, right up front, that what I have to write about will challenge some of the well accepted and traditionally comfortable ways genealogy is being taught and practiced by nearly everyone. The whole point of this series will be to move forward into genealogy based on information technology. To take advantage of the vast amount of online information that is presently available and constantly increasing, we need to readjust our way of viewing genealogical research. Before getting too much further into this topic, I need to acknowledge the constant genealogical response to any reference about online resources that not everything is online and that you have to do "traditional" genealogy sitting in a library or archive to find much of the information that has yet to be digitized. As I have said many times before, that is likely true, but the people who use that as an excuse to ignore online sources cannot articulate what is and what is not online in any meaningful way. I am painfully aware of the amount of information that is still locked up on paper, but I also recognize the vast amount of information that can be accessed online. I suggest that almost all genealogists can add significant amounts of information using online sources and if there are sources that are still only on paper, the existing online resources give you the ability to locate and gain access to those records. One of the important things I have learned from my time digitizing records at the Maryland State Archives is the vast amount of information that exists about people who lived in the United States. I am also learning home much of that information is being digitized every day, day after day. 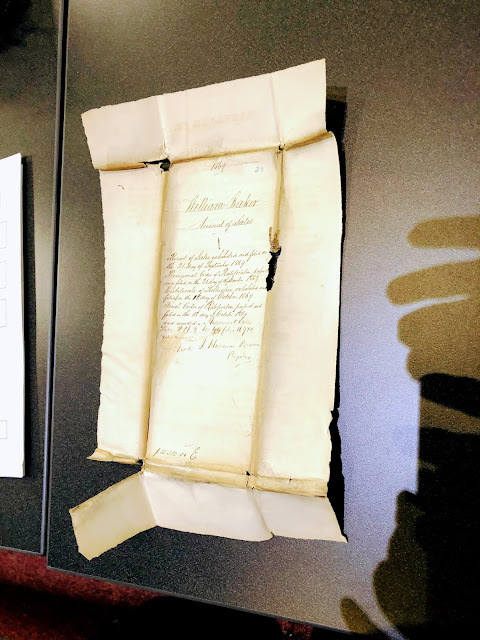 It will still be many years before all the Maryland probate records are digitized, but this is only one project by one entity, in this case, FamilySearch, digitizing records around the world. Another thing that has impressed me since I have been here is that so many of the people I talk to about genealogy are totally unaware of the freely accessible records on FamilySearch.org. Just two nights ago, I was helping a friend find records for a family from Mexico. We were unsuccessful in finding information about the parents but had been adding information about the children in the family. We did some additional searches on Ancestry.com and found the parents' marriage record with the names of both sets of grandparents. This experience illustrates part of the methodology I will be writing about. The team found that industrialization profoundly altered family life. Before 1750, most Americans found a spouse within six miles of their birthplace, but for those born in 1950, that distance had stretched to about 60 miles. Before 1850, marrying in the family was common — on average, fourth cousins married each other, compared to seventh cousins today. Curiously, they found that between 1800 and 1850, people traveled farther than ever to find a mate — nearly 12 miles on average — but were more likely to marry a fourth cousin or closer. Their hypothesis is that changing social norms, rather than rising mobility, may have led people to shun close kin as marriage partners. See "MyHeritage Science Team’s Research Featured in the Prestigious Journal Science." What is the point I am making with these examples? The point is that genealogy has traditionally been a linear pursuit based on extremely limited information. It is now changing into a loosely organized web-like pursuit based on an overwhelmingly large amount of information and there is a direct relationship between the explosion in the availability of information and the breakdown in the traditional viewpoint of genealogical research. In the past, some genealogists have been involved in what has been called "cluster research." The idea of cluster research is that more information can be obtained from researching the family members, relatives, friends, and surrounding neighbors of our ancestral families and in many cases the research that results is more accurate. But cluster research was extremely difficult and time-consuming. It also seemed pointless to most researchers since they weren't obviously related to the people being researched. How has that changed? We now have the ability to search vast databases of basic information about our the places where our families lived. We can extract information that gives us the ability to bring our family into sharp focus. This series is about that process. 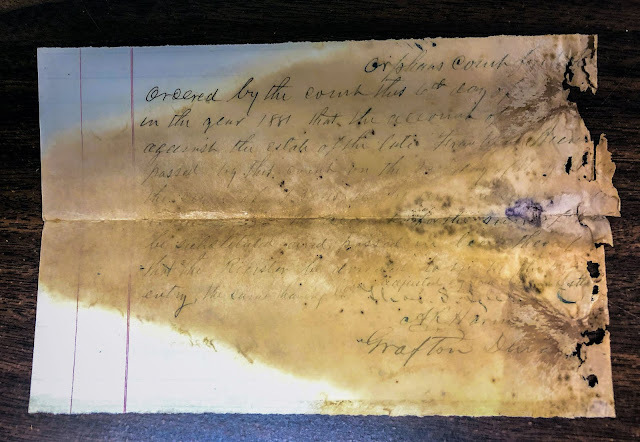 Since my wife and I are currently serving as volunteer FamilySearch Record Preservation Specialists at the Maryland State Archives, it follows that I am interested in all of the aspects of the operation of the Archives as well as the resources available. 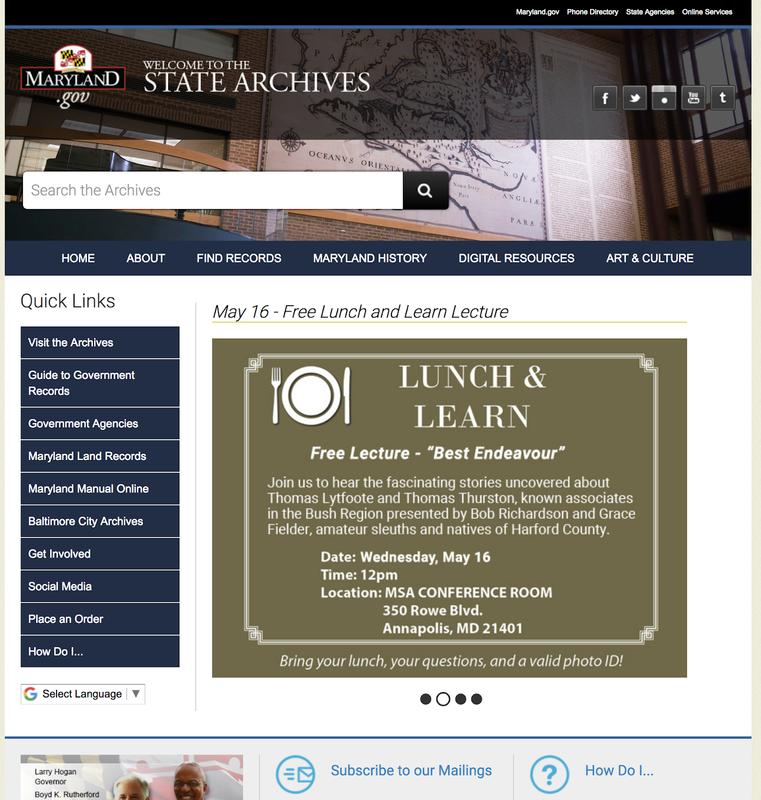 The Maryland State Archives has a very detailed and extremely valuable website that provides an in-depth explanation of the records as well as a major introduction to the history of Maryland. I am only part way through reading all of the articles and explanations on this very detailed website. 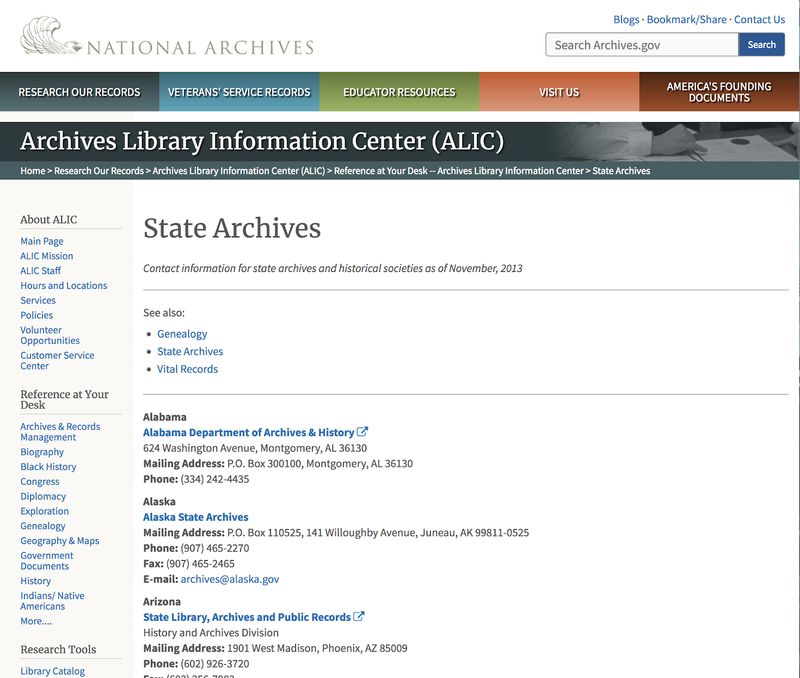 As the first screenshot from the National Archives shows, there are Archives in every state of the United States. There comes a time in the life and learning of genealogists when they realize the vast number of records that they have never looked at or attempted to research. This is when the genealogist visits a state archive. Here in Maryland, for example, as we have been digitizing records, I am just now beginning to see that nearly every person who lived in this state in the 1800s could be found in the records we have seen so far. The number of people in the probate records is staggering. I may have mentioned before that the volunteers here in the Archives will digitize somewhere between 1.5 and 2 million records this year and the project is expected to continue for 6 to 8 more years or so. 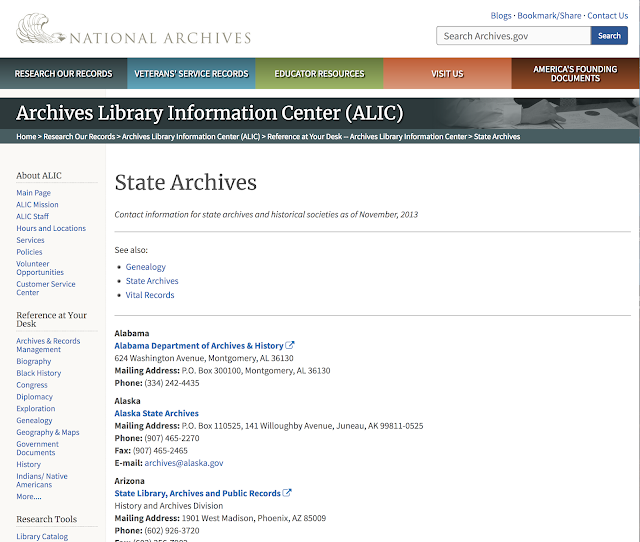 Many of the state archives have substantial online, searchable databases. However, entering the world of the archives can be a daunting and complicated process. Many of the archives have access restrictions that include registering and complying with strict use procedures. Here is an example from a video about the Maryland State Archives. Some of the state archives are closely associated with a state library and/or a state historical society. Genealogically important records may be located in any one or all of these additional repositories. Perhaps it is time that you began this expanded aspect of your genealogical research efforts. At RootsTech 2018, MyHeritage announced a program to supply free DNA testing kits to adoptees seeking their birth parents. I wrote about this program in a post entitled, "Free DNA Testing for Adoptees from MyHeritage.com." Now, that fabulous offer has been expanded. Here is the announcement of the expansion from the MyHeritage.com blog post entitled, "DNA Quest Goes Global." 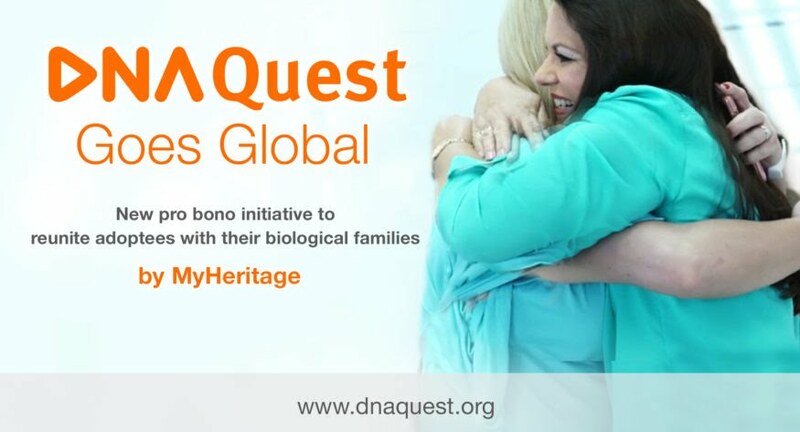 Last month we launched DNA Quest, a new pro bono initiative to help adoptees and their birth families reunite through genetic testing. You can also view this video by Aaron Godfrey from MyHeritage on YouTube.com. Plato, Republic, translated into the Latin language by the Humanist Antonio Cassarino. Rome, Biblioteca Apostolica Vaticana, Vat. lat. 3346, fol. 153v. This is pretty much a never-ending series. 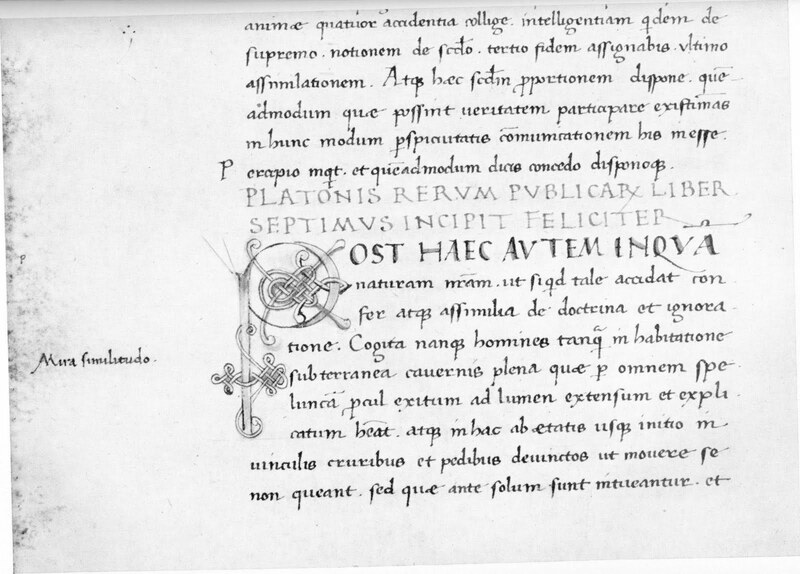 But I only post to it when I think about Latin, which only happens when I am looking at old documents. But since that is what I am doing right now all day long every day, I am back to Latin. Here we go with the Latin words and phrases. You might want to remember the rules of this series which are that I am only selecting terms that I have actually heard used at some time in my 39-year career or phrases that have passed into English and no longer sound like Latin. nudum pactum - literally "naked promise"
We spent an entire year in a Contracts course in law school and I can say that I still did not understand contracts until I had been practicing law for a number of years. Technically this term refers to an unenforceable promise due to lack of consideration. The phrase "lack of consideration" is the one that takes a long time to understand. Obviously, having made these statements, I will not try to summarize years of contract law in one or two paragraphs. The key here is the idea that the contract is unenforceable because one of the parties didn't get anything out of the deal. Sort of. nota bene - literally "consider or note well"
Do people really think that using these phrases impresses anyone? Anyway, people (attorneys) use this phrase occasionally when they are concerned that their most important argument will be ignored. But when the judge sees this used, he or she will automatically assume that what the attorney is trying to say is that the argument has no support. non obstante verdicto - literally "notwithstanding the verdict"
This phrase has been shortened to nonobstante (pronounced non-ob-stan-tay) and it has nearly passed into English. It means that the judge is about to overrule the jury's decision or verdict in the case. As a side note, civil juries now make decisions not verdicts and the term verdict is more commonly used only in criminal cases. non faciat malum, ut inde veniat bonum - literally "not to do evil that good may come"
This is another phrase that has been shortened. The short form is "non faciat malum." This phrase is actully used in the context of arguments that some reprehensible act really promotes a good result. The phrase essentially means that the good does not justify the bad act. The argument does work on occasion. non est factum - literally "It is not [my] deed"
This is used in a defense when a party is claiming that his or her signature to a contract or document is not valid because he or she did not know what they were signing. This argument also works if there are substantiating and supporting facts that would make the execution of the contract subject to some factual dispute. non compos mentis - literally "not in possession of [one's] mind"
Yes, people do say these things and write them in legal briefs. It is more polite than saying that your client is crazy. nolo contendere - literally "I do not wish to dispute"
This is another phrase that has been shortened to "nolo" and has long since passed into English as in a "nolo plea." You also hear questions such as "Is your client going to plead nolo?" It means that the person will not dispute the claim or charge against him or her. nolle prosequi - literally "not to prosecute"
This phrase gets confused with "nolo." But this is the state or government representative informing the court that the case will not proceed to prosecution. nisi prius - literally "unless first"
This is actually the phrase and it is not same as "nisi" variously pronounced as "nicey" or "neesy." It also does not have anything to do with the Toyota car of the same name. But it might be considered a compliment if said to the driver of such a car. This phrase refers to the court that has original jurisdiction in a matter. The word "jurisdiction" here is something many attorneys never understand during their entire careers. NISI. This word is frequently used in legal proceedings to denote that something has been done, which is to be valid unless something else shall be done within a certain time to defeat it. For example, an order may be made that if on the day appointed to show cause, none be shown, an injunction will be dissolved of course, on motion, and production of an affidavitof service of the order. This is called an order nisi. Ch. Pr. 547. Under the compulsory arbitration law of Pennsylvania, on the filing of the award, judgment nisi is to be entered: which judgment is to be as valid as if it had been rendered on the verdict of a jury, unless an appeal be entered within the time required by the law. Is that clear? This is why attorneys can charge money for what they do. nemo plus iuris ad alium transferre potest quam ipse habet - literally "no one can transfer a greater right than he himself has." Are you going to guess that this phrase also has a short form? Yes, it does. The short form is "ad alium." The phrase is sometimes used to refer to the fact that a purchaser of stolen goods cannot obtain ownership as against the rightful owner. By the way, the phrase has nothing to do with the captain of the Nautilus. This is why some police departments have piles of bikes. I still have a huge number of these wonderful sayings to look at. See you sometime. As I mentioned in the previous post in this series, the enemies of paper are water, mold, insects and time. 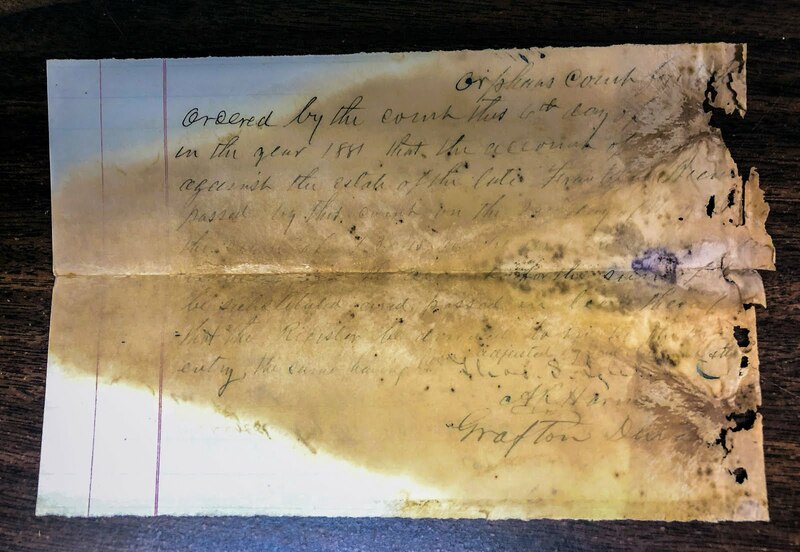 The example above is typical of an old piece of paper that has water, mold and chemical decomposition due to the passage of time. Even under the best of conditions, most of the paper documents of the world will simply disintegrate. 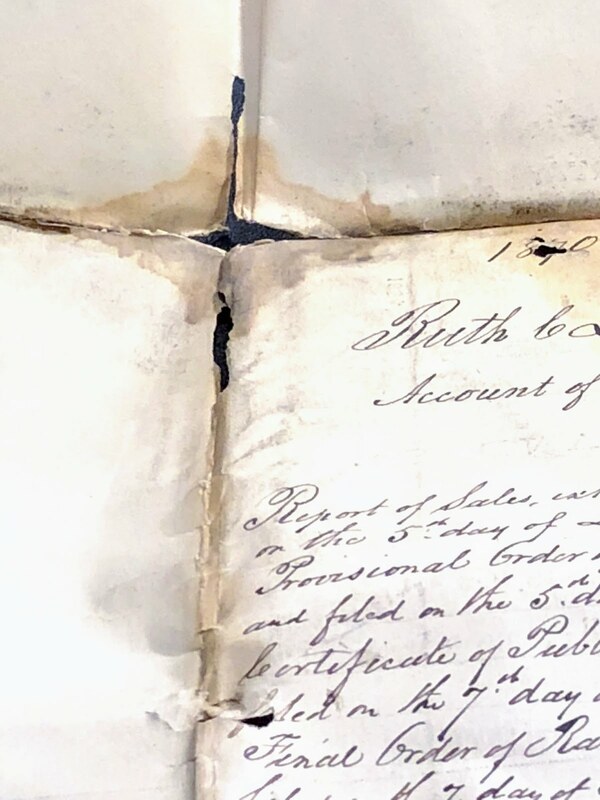 I am guessing that few people outside of archivists, librarians, some genealogists, and other historical researchers have ever seen or had to deal with paper as damaged as the image shows above. The blue discolored areas are mold and chemical decomposition. I have acquired thousands of documents over the years and some have been in even worse condition than the image. I also have a collection of thousands of books and so I have seen paper in all stages of destruction. I remember one inexpensive paperback book that I acquired when I was a teenager. Many years later, I decided to read the book again and found it had decomposed into small tatters of what was formerly paper. On the other hand, I have handled books hundreds of years old and found them in almost perfect condition. This illustrates the fact that the quality of the paper and the conditions in which the paper has been stored can drastically affect the rate of decay. Here are some observations on the various factors and causes of damage to paper including books, of course. 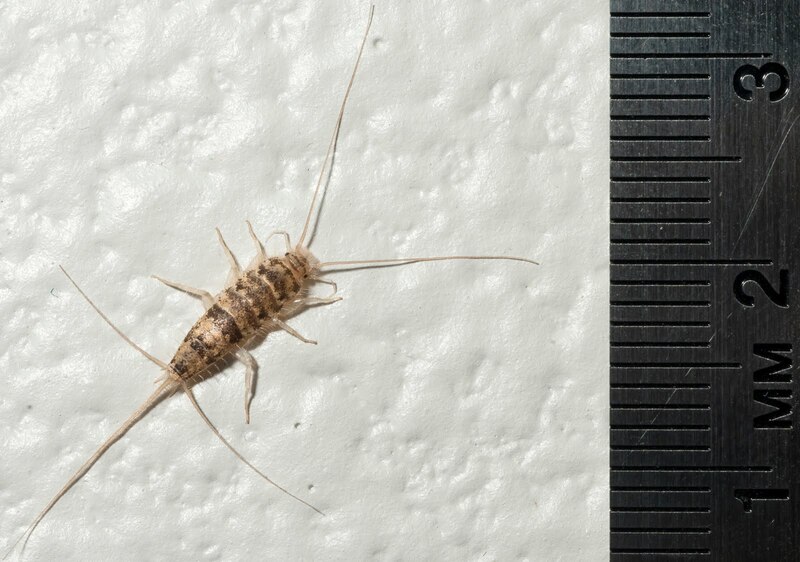 One of the most common insect enemies to paper and books is the common silverfish or Thermobia domestica. Here is a photo of a silverfish. Silverfish eat the lignocellulose found in wood and therefore paper. They are almost impossible to eradicate entirely. But they can be controlled by keeping the area where paper or books are stored dust free and dry. Here is a quote from the South Australia Community History website article entitled, "Managing pests in the collection: Integrated Pest Management (IPM)" that talks about what to look for to determine if you have an insect pest problem. A few years ago, we had some documents stored on shelves in our garage. They were old business documents and not particularly important. We found that we had a termite infestation and they had chewed their way up the wall into the shelves and eating into the documents. We had to go through the entire termite eradication routine with holes drilled in the walls and floors and poison all around the house in holes. The treatment apparently worked because yearly inspections showed no further damage, but many of the old documents were ruined. 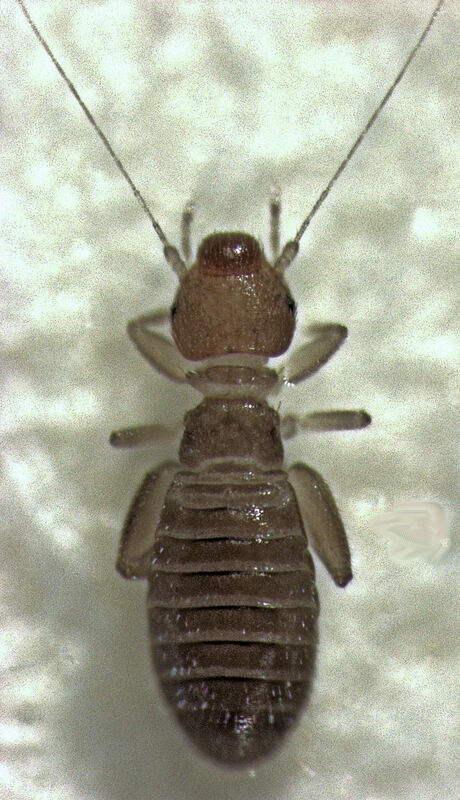 Here is a photo of some common termite of the infraorder isoptera. Termites are a worldwide problem. They live on every continent except Antartica. They are voracious eaters of anything made of wood or wood products. 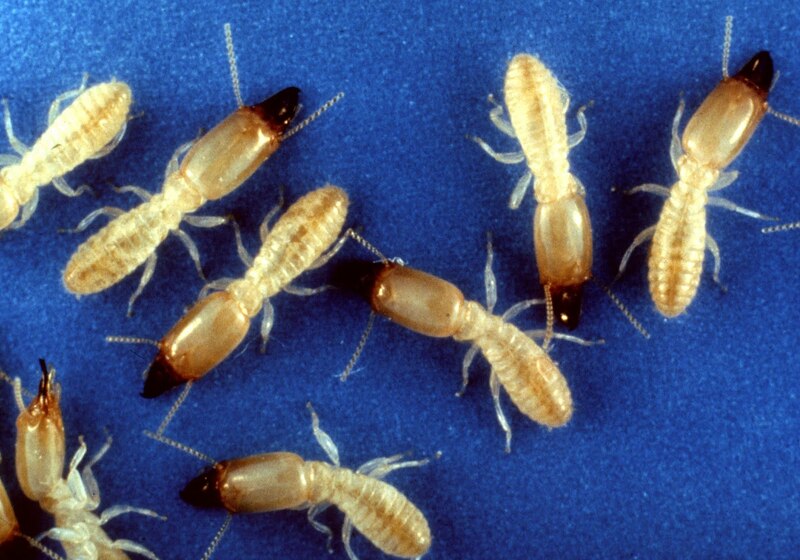 A termite queen can live up to 50 years. Good luck if you find termites. Here is a photo of some booklice or Liposcelis sp. Crickets also eat paper and so do many other insects. The best conservations procedures include isolating the paper products in clean, controlled areas. As I learned with my documents stored in my garage, that type of storage puts the documents at risk. It may seem almost impossible to avoid insects infestations, especially if you live in a warm, humid climate area. When we lived in the Republic of Panama, we lost many organic items to mold and insects. In Mesa, Arizona, where we lived for years, papers and documents kept indoors and in dry, dark areas such as interior closets were not affected by insects. This series will go on indefinitely. Stay tuned. Do You Know Your Past? Back Up Your Data NOW!